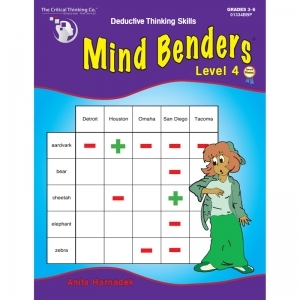 Mind Benders®, our best-selling deductive thinking puzzles, develop logic, reading comprehension, and mental organizational skills that are vital to achieving high grades and top test scores in all subjects. They're also great for developing real-life, problem-solving skills. 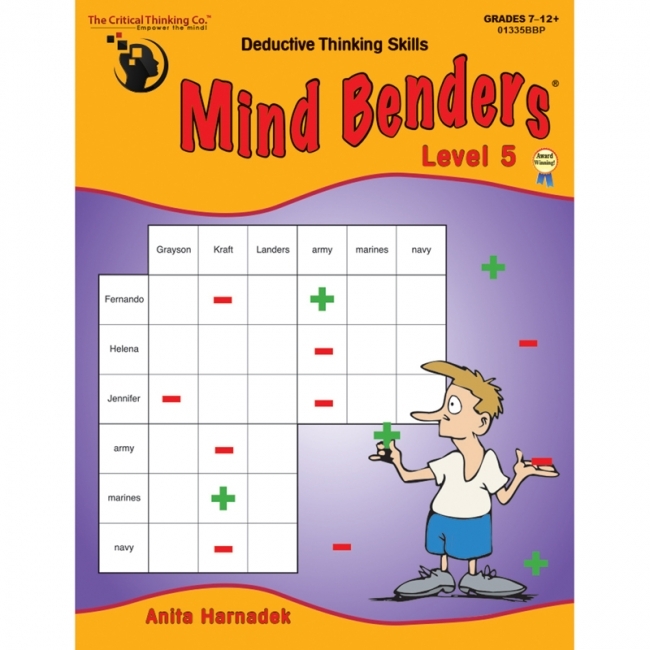 Your students will learn to carefully analyze each Mind Benders® puzzle and its clues, identifying logical associations between people, places, and things. The key is to start with the most obvious associations, then deduce less obvious associations until everything finally fits together. Includes step-by-step instructions and detailed answers. Book levels spiral in difficulty within grade range. 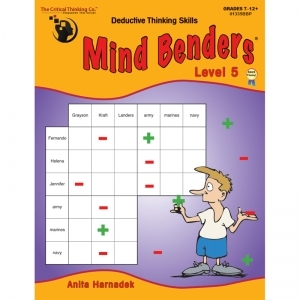 This 64-page book contains several of our best-selling deductive thinking puzzles. It develops the logic, reading comprehension, and mental organization skills vital to achieving higher grades and top test scores in all subjects. These award-winning, fun puzzles are also great for developing real-life, problem-solving skills! 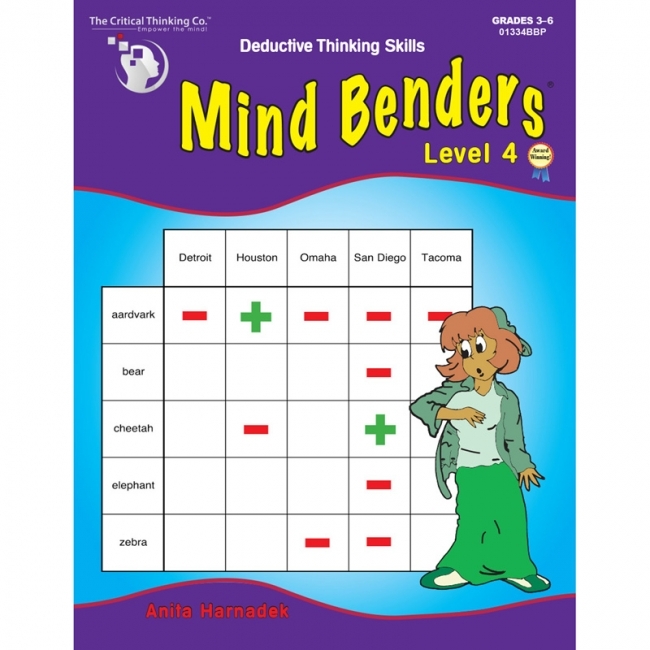 Students learn to carefully analyze each Mind Benders® story and its clues, identifying logical associations between people, places, and things. The key is to make sure you get all the information out of each clue, by starting with the most obvious associations, then deducing the less obvious associations until everything finally fits together. Step-by-step instructions and detailed answers are included. Puzzles increase in difficulty. 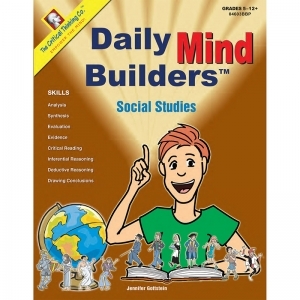 This 136-page book is comprised of intriguing activity pages to wake up sleepy brains for the day's lessons. Each activity page takes about 5-15-minutes to solve and develops the most important reading comprehension skill found on all standardized reading tests. Synthesizing disparate information and using the result to produce a reasonable conclusion is an essential skill assessed on standardized reading tests. This comprehension skill usually determines a student's reading score—and every Daily Mind Builders: Language Arts activity develops this skill. The first puzzle is a short, true mystery. 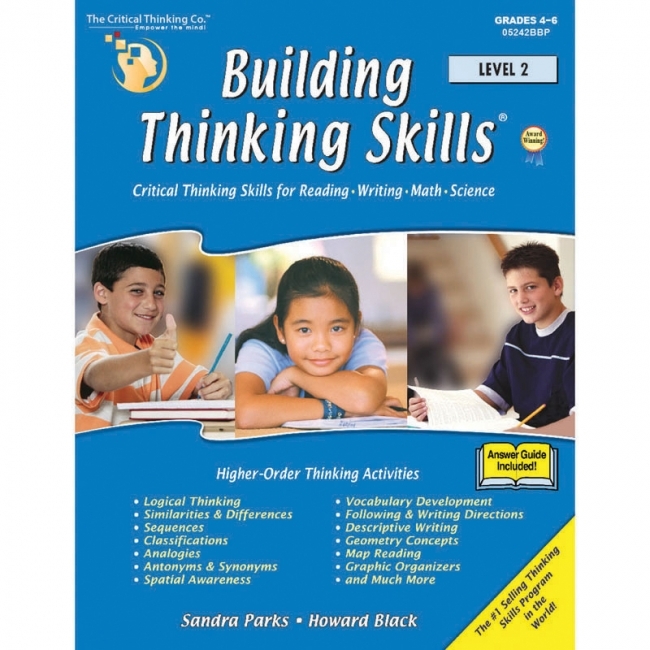 Its solution requires careful reading, inferential reasoning, and deductive thinking. 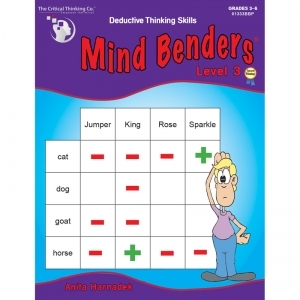 The second puzzle involves deductive thinking, and is designed to build vocabulary and associative thinking skills. This puzzle uses a process of elimination involving the meanings of words or relationships between words. Try a sample and you'll be hooked! 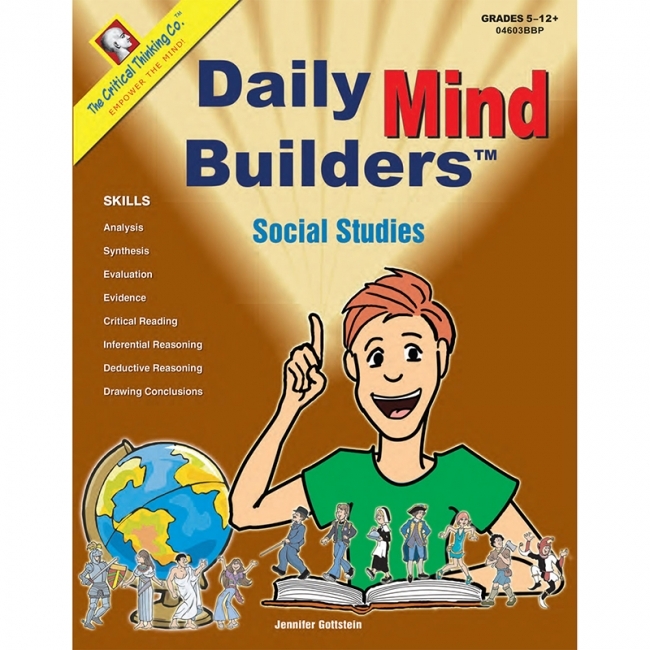 The best use of these books is when presented as a non-threatening, non-graded, fun activity where students are praised for all logical answers even if they don't happen to be the correct answers. Remember, in critical thinking, the journey is as important as the destination, and all reasonable efforts at critical thinking should be commended. Motivational beginning activity as an addition to the curriculum. Culminating activity after a lesson or at the end of the day. Fill-in activity when there is an awkward time break during the school day. Valid educational activity for students who finish assigned activities earlier than their classmates. 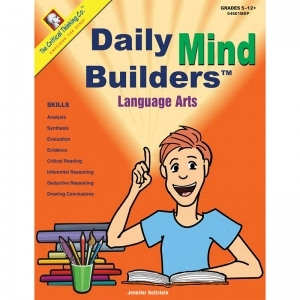 This 144-page book is comprised of intriguing activity pages to wake up sleepy brains for the day's lessons. 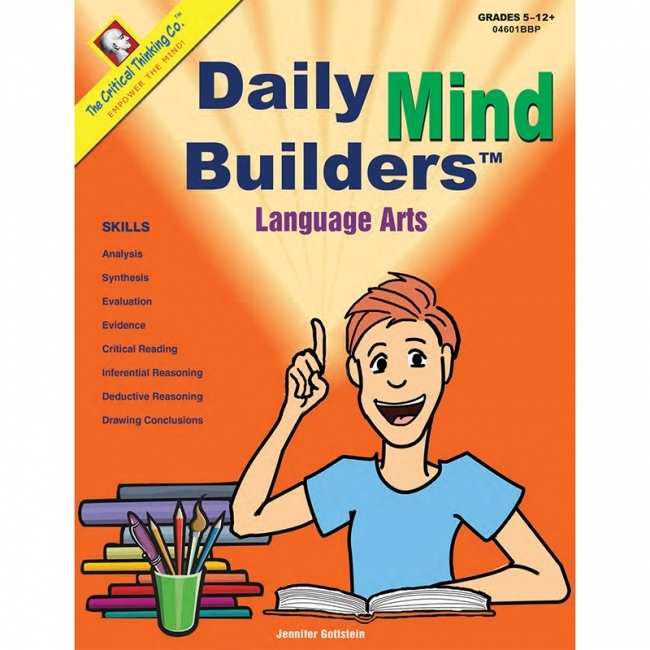 Each activity page takes about 5-15-minutes to solve and develops the most important reading comprehension skill found on all standardized reading tests. Synthesizing disparate information and using the result to produce a reasonable conclusion is an essential skill assessed on standardized reading tests. This comprehension skill usually determines a student's reading score—and every Daily Mind Builders: Science activity develops this skill. This 136-page book is comprised of intriguing activity pages to wake up sleepy brains for the day's lessons. Each activity page takes about 5-15-minutes to solve and develops the most important reading comprehension skill found on all standardized reading tests. Synthesizing disparate information and using the result to produce a reasonable conclusion is an essential skill assessed on standardized reading tests. This comprehension skill usually determines a student's reading score—and every Daily Mind Builders: Social Studies activity develops this skill. Each daily activity page includes two puzzles that are often solved in 5-15 minutes. The first puzzle is a short, true mystery. Its solution requires careful reading, inferential reasoning, and deductive thinking. 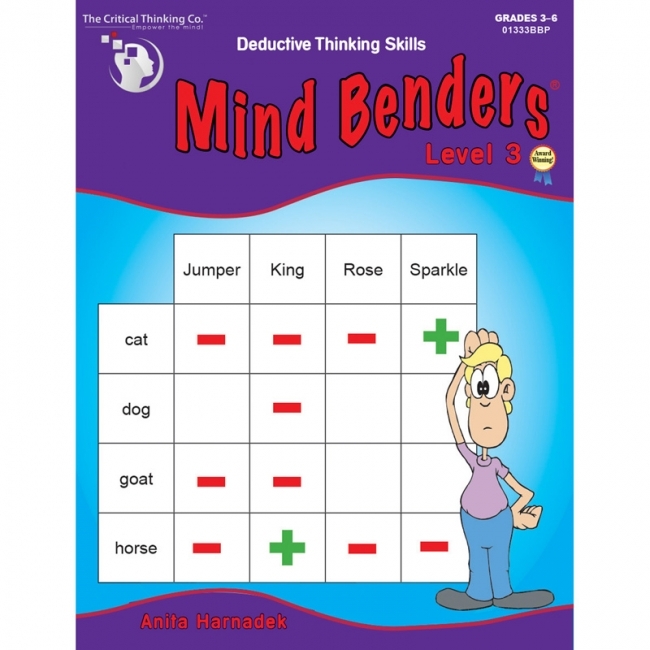 The second puzzle involves deductive thinking, and is designed to build vocabulary and associative thinking skills. This puzzle uses a process of elimination involving the meanings of words or relationships between words. Try a sample and you'll be hooked! 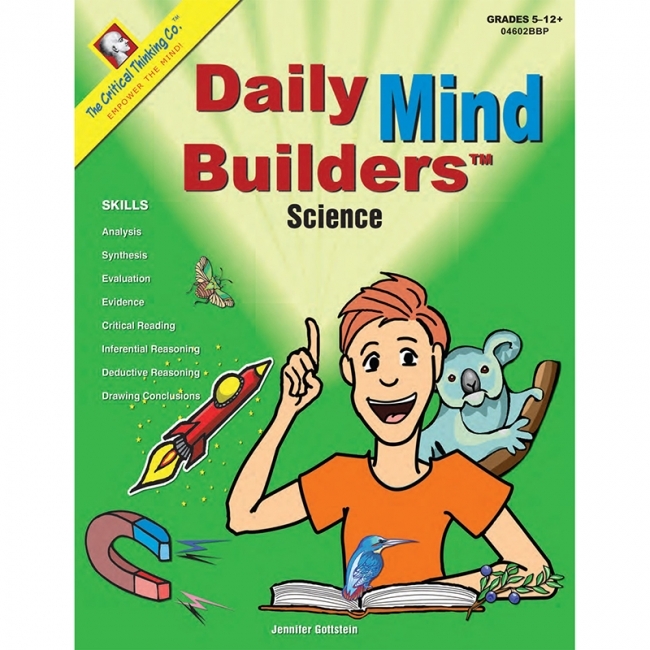 The mind-building lessons and activities in this 112-page book teach topics and skills drawn from state and national science standards to prepare students for more advanced science courses and new assessments that measure reasoning, reading comprehension, and writing in science. Students read lessons that include a variety of charts, tables, and graphs. Then they answer critical thinking questions to improve their understanding of the science concepts and develop their reading comprehension, inferential and deductive thinking skills. Students can't just scan the story for answers—they must carefully analyze and synthesize the information from the text, charts, tables, and graphs to explain and support their answers. 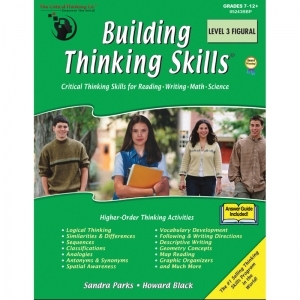 Many questions in this book ask students to use complete sentences to explain their thinking. The ability to express their thoughts—supported by evidence—in writing, is not only important in science assessment, it is essential when communicating with other people in school and work. It also promotes better understanding of the concepts being studied. 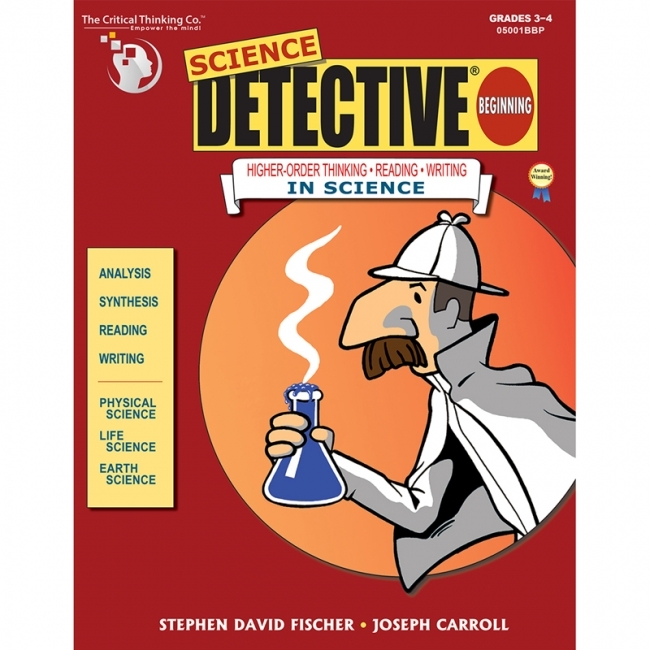 The questions in Science Detective® Beginning are modeled after questions found on science assessments but require more critical thinking. There is a growing trend to evaluate responses to open-ended questions in the context of logical reasoning, and many science students score poorly on these test items. 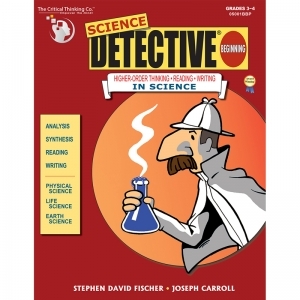 The carefully designed questions in this book will not only develop thinking, reading, and writing skills, but will also familiarize your students with questions found on contemporary science assessments. Includes teacher and student introductions, a chart of topics and key ideas to help select activities, and detailed answers. Students read lessons that include a variety of charts, tables, and graphs. Then they answer critical thinking questions to improve their understanding of the science concepts and develop their reading comprehension, inferential and deductive thinking skills. Students can't just scan the story for answers—they must carefully analyze and synthesize the information from the text and the charts, tables, and graphs to explain and support their answers. Many questions in this book ask students to use complete sentences to explain their thinking. The ability to express their thoughts—supported by evidence—in writing, is not only important in science assessment, it is essential when communicating with other people in school and work. It also promotes better understanding of the concepts being studied. 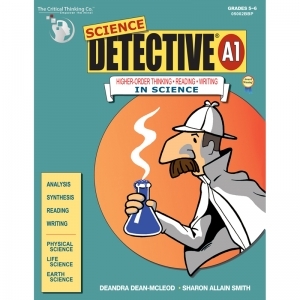 The questions in Science Detective® A1 are modeled after questions found on science assessments but require more critical thinking. There is a growing trend to evaluate responses to open-ended questions in the context of logical reasoning, and many science students score poorly on these test items. The carefully designed questions in this book will not only develop thinking, reading, and writing skills, but will also familiarize your students with questions found on contemporary science assessments. 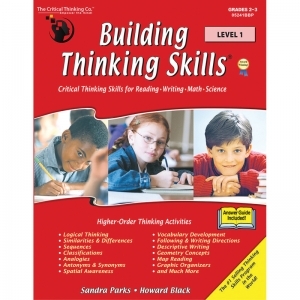 This colorful, engaging 272-page book develops critical thinking skills necessary for success in reading, writing, math, science, social studies, and standardized tests in Grades K-1. It uses a series of lessons with math manipulatives and language integration techniques to teach thinking skills. The five cognitive skills developed in this series (describing, finding similarities and differences, sequencing, classifying, and forming analogies) were selected because of their prevalence in academic disciplines and their frequency in objective tests. 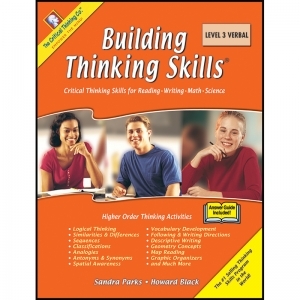 Since improved school performance is an important goal of thinking skills instruction, many variations of each of these thinking skills are promoted in the activities. 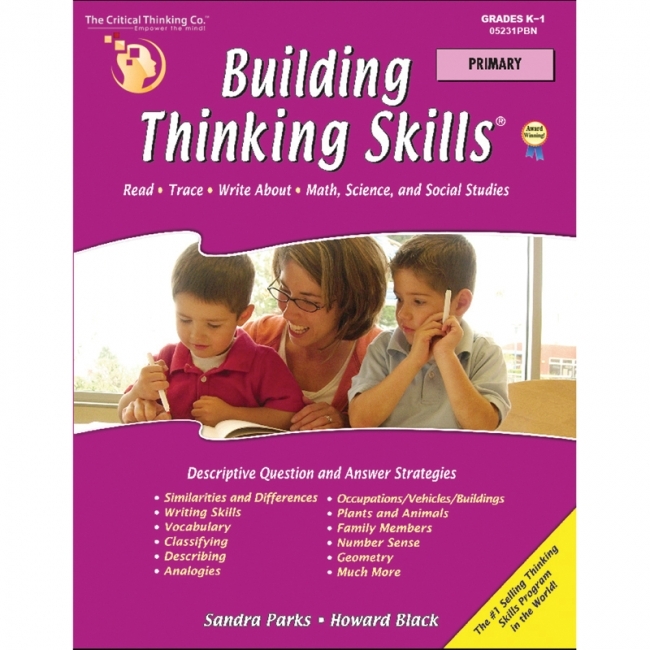 Thinking skills are sequenced in the order in which a child develops intellectually. A child first learns to observe and describe objects, to recognize the characteristics of an object, and then to distinguish similarities and differences between the objects. Describing, comparing, and contrasting skills are necessary to a child's ability to put things in order, to group items by class, and to think analogically. 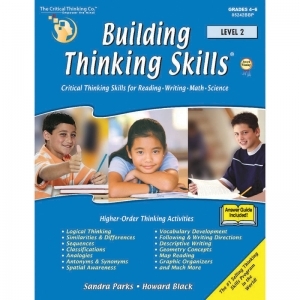 This engaging 416-page book develops critical thinking skills necessary for success in reading, writing, math, science, social studies, and standardized tests in Grades 4-6. 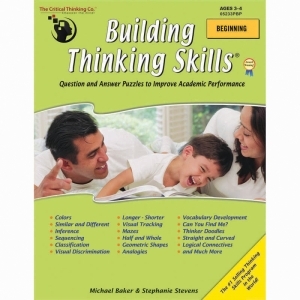 The Building Thinking Skills series is the bestselling thinking skills program in the world! The engaging, highly-effective activities are developmentally sequenced. Each skill (for example, classifying) is presented first in the semi-concrete figural-spatial form. Students also learn important academic vocabulary, concepts, and skills as they analyze relationships between objects, between words, and between objects and words by: -Observing, recognizing, and describing characteristics -Distinguishing similarities and differences -Identifying and completing sequences, classifications, and analogies These processes help students develop superior thinking and communication skills that lead to deeper content learning in all subjects. These processes help students develop superior thinking and communication skills that lead to deeper content learning in all subjects. 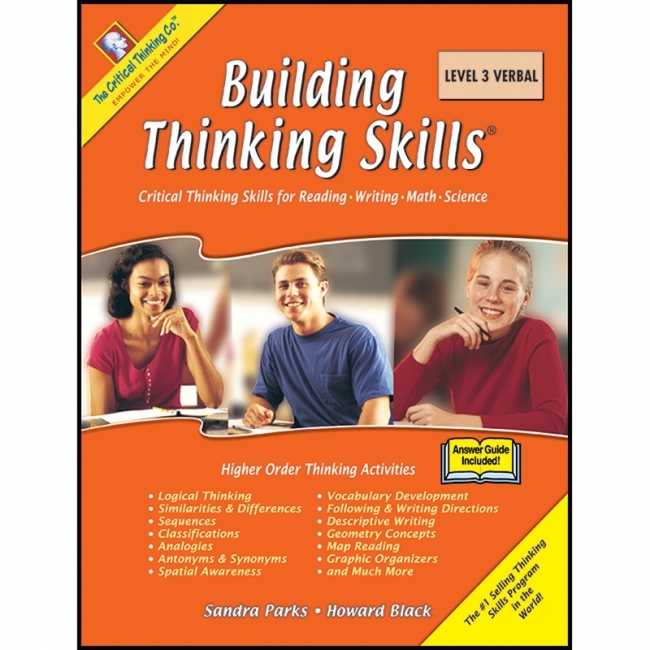 Building Thinking Skills® provides highly effective verbal and nonverbal reasoning activities to improve your children's vocabulary, reading, writing, math, logic, and figural-spatial skills, as well as their visual and auditory processing. 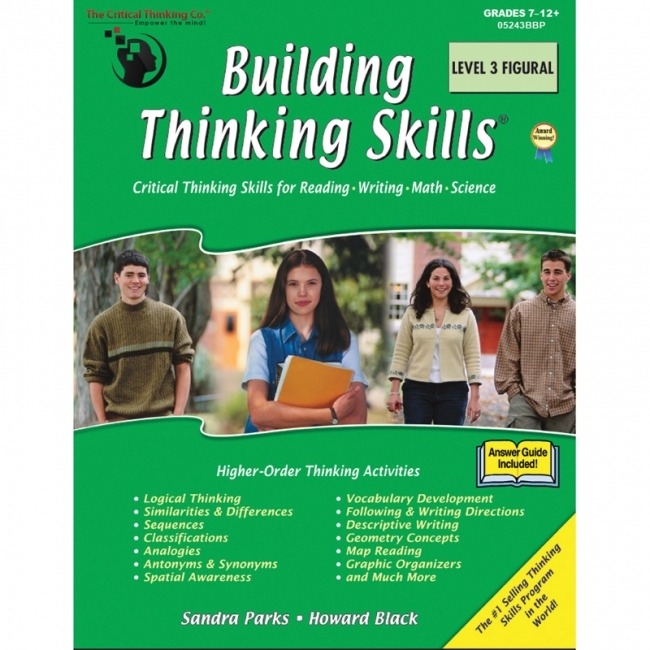 This exceptional series provides a solid foundation for academic excellence and success in any assessment. The activities are developmentally sequenced. Each skill (for example, classifying)is presented first in the semi-concrete figural-spatial form and then in the abstract verbal form. Children learn to analyze relationships between objects, between words, and between objects and words as they: Observe, recognize, and describe characteristics. Distinguish similarities and differences. Identify and complete sequences, classifications, and analogies. These processes help children develop superior thinking and communication skills that lead to deeper content learning in all subjects. These processes help students develop superior thinking and communication skills that lead to deeper content learning in all subjects.